After moving to Chester County in 2011, she noticed that the rolling hills and scenic views she loved so much were tarred by the large amount of trash on the roadsides. So, rather than ignoring the problem, she decided to select areas near her home and started cleaning. In 2013, she began cleaning Route 926 in Kennett Square. Then she started cleaning from her house all the way down Route 52 into Delaware, as well as parts of Route 141 until she reached her work in Wilmington. She recruited her husband, Dan; stepson Patrick; nephew, David; and foster sons to join her clean-up mission. She even paid the kids to participate, so they wouldn't complain so much. Her church is located near U.S. 202 and U.S. 1, so she started cleaning all the way to church and back from her home. This effort took quite a while, and since there are so many hills, it included dragging bags of trash up hills, lots of falls, and getting very dirty. But after the first year of cleaning the 7-mile highway stretch, it became much easier. In 2015, she wanted to throw her husband a 40th birthday at a restaurant in Toughkenamon. As she drove down U.S. 1, however, she was mortified at the amount of trash on the roadside and median. There was a sofa, bed, and lots of random debris as far as the eye could see. So, she decided to clean up from Kennett Square to Toughkenamon. This resulted in more than 500 bags of trash on a 3.5 mile stretch of road. McDowell decided to officially sponsor a section of U.S. 1 in 2016 along with her group, People Who Use Trash Cans. Through the group, she gets people to help her who do not want to make an official commitment, but would rather volunteer a few times. She provides all the supplies they need, and to date, she has cleaned up 3,597 bags of trash from Chester County, Delaware County, and New Castle County, Delaware. This past spring, she organized a Great American Cleanup of Chester County Group on Facebook and gathered volunteers to help remove more than 800 bags of trash on U.S. 1 from Kennett Square to West Grove. She now sponsors more than 15 miles of roadways. McDowell says her favorite part of the roadside cleanup is looking at the streams and rivers that run along the highway, knowing that she is protecting the area for the future as she removes all the plastic, cans, and bottles. She also appreciates the people that stop to thank her, drop off water, and encourage her. If you're interested in volunteering with McDowell, you can find her People Who Use Trash Cans on Facebook. 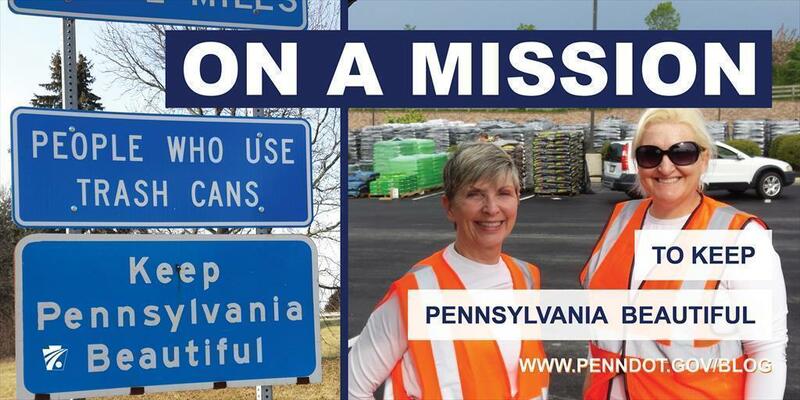 Or, for more information on volunteering for roadway cleanup, visit PennDOT's website.